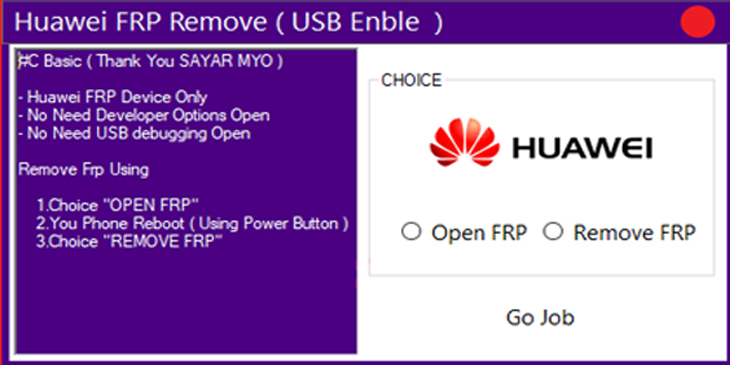 Huawei FRP Remove Tool is a little application for windows PC which enables you to remove or sidestep the FRP Protection from your Huawei gadgets rapidly with its basic and easy to use interface. It enables you to remove the Android Factory Reset Protection from practically every one of the models of Huawei Smartphone. Huawei FRP Remove Tool does not expect you to empower the Developer alternatives and USB troubleshooting before expelling FRP Protection from your Huawei gadget. FRP Protection is a security technique actualized by organizations like Huawei to ensure somebody can't abuse your telephone on the off chance that you've lost it or it was stolen. Be that as it may, By utilizing Huawei FRP Remove Tool, you can basically remove this assurance from your Huawei gadgets. At that point you will most likely wipe and manufacturing plant reset your Huawei telephone as wanted. So as to utilize the Huawei FRP Tool legitimately, you have to introduce the Universal ADB Driver on your Computer. When Driver is introduced you can effectively associate your Android Device to the PC, and dispatch the Huawei FRP Tool on the PC.